Cut up chicken into serving size pieces and set aside. In a large container combine all ingredients except the chicken and mix well. Once the batter is mixed add the chicken and stir until all pieces are coated. Cover and let set in the batter overnight in the refrigerator. The following morning stir the batter and put it back in the refrigerator until you are ready to cook. Ten minutes prior to cooking take the container out of the refrigerator. Fill a wok or frying pan with enough oil to cover the chicken pieces and heat. Test hotness of oil by dropping some batter in it. If the oil is hot enough the batter will begin to cook on contact. If it does not wait until it gets hot. 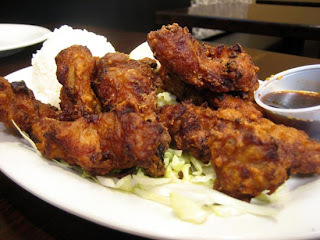 Deep fry the Mochiko batter chicken until golden brown. Let the cooked chicken drain on wire rack over some paper towels or newspaper then serve. Makes about 8-10 servings.